Buckwheat honey is the product made by bees that collect nectar and pollen primarily from the flowers of buckwheat plants. It's a very dark honey that is sometimes called black honey and has a flavor similar to molasses. Buckwheat honey is an organic alternative to over-the-counter cough medicines. 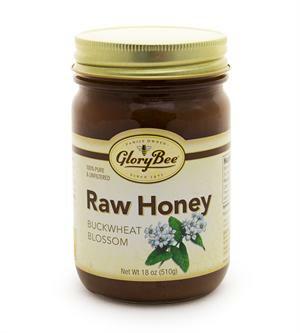 The honey used in GloryBee's Raw Buckwheat Honey comes from Eastern Oregon. This Buckwheat Blossom Honey from Glory Bee is 100% Pure, Grade A Honey with no additives or fillers. Certified GMO Free.